RAs practice using fire extinguishers to put out small fires. 2:57 p.m., Aug. 29, 2008--Crawling through a smoke-filled hallway in a residence hall may not top anyone's list of fun things to do on a summer evening, but when it's part of an organized fire safety training session the experience can provide an invaluable lesson in fire safety awareness. 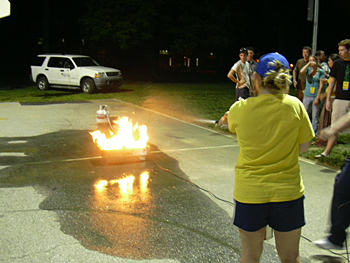 On Monday, Aug. 25, some 235 Residence Life staff members joined six staffers from UD's Department of Occupational Health and Safety (OHS), UD police officers, Aetna Hose, Hook and Ladder Co. volunteers and the Newark City Fire Marshal in a fire-safety training event held Monday evening at various East Campus locations. Skelley said the residence hall, which is not being occupied this year, was filled with simulated smoke, while Residence Life staff received instruction on how to safely navigate a smoke-filled hallway by counting the doors to the exit. Skelley said the training will help Residence Life staff, including residence life assistants (RAs), in their job responsibilities while providing fire safety information to share with student residents. McSweeney said that other campuses across the country have conducted similar campaigns to raise awareness and provide guidance to students in the event of a fire. The classroom sessions covered topics such as room inspections, reporting unsafe acts and initiating corrective action for deficiencies in the residence halls that develop during the course of the school year, McSweeney said. Richard Goldschein, a student in the College of Human Services, Education and Public Policy, said that the extended training format helped participants to learn some of the more detailed points about fire safety. McSweeney said during the course of the school year, information as to why a particular fire alarm occurs in their residence hall will be provided during weekly meetings between OHS/Fire Prevention and Safety program, Public Safety, Facilities electronics and Residence Life staff.